The BU-67X02U/3U USB device provides a portable off-the-shelf interface to 1 or 2 dual-redundant MIL-STD-1553 channels, 4 ARINC 429 Receive channels, 2 ARINC 429 Transmit channels, 8 user-programmable digital discrete I/O's, IRIG-B time code input, and 1 Pulse-per-Second (PPS) Output. The device is available as 1553 only, 429 only, or fully populated with 1553/429 Multi-IO. The USB device can be powered directly from the USB interface or by an external power source (included). Its small size, light weight, and durable construction make the BU-67X02UX a common tool for use in field service, flight line test equipment, and flight instrumentation applications. 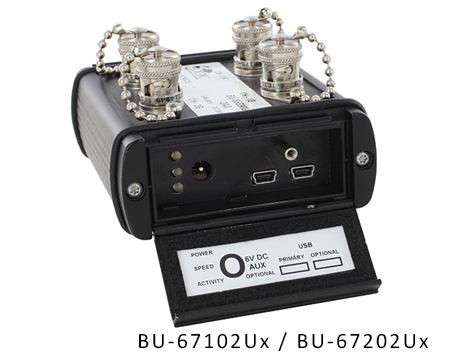 The BU-67103UX provides the same exact capabilities in a non-rugged package that is suitable for lab applications. Each 1553 channel can operate in Bus Controller (BC) or Multi-RT (0 to 31) modes, and each mode has the ability to run a concurrent Bus Monitor (MT). The ARINC 429 channels can support full data line rate for low, high, and ARINC 575 speed communications with automatic slew rate adjustment while providing multiple reception and transmission methods for ARINC messages. The device includes the BU-69092S MIL-STD-1553 AceXtreme® C Software Development Kit (SDK) and the DD-42992S ARINC 429 C SDK, including source code samples and detailed documentation, to support all modes of operation. Optional graphical software packages include the MIL-STD-1553 BusTrACEr Analyzer/Simulator, ARINC 429 Data Bus Analyzer (DBA), ARINC 615 Data Loader, LabVIEW Multi-I/O support package, and dataSIMS Real-Time Avionics Bus Analysis & Simulation Tool. The optional software packages allow users to easily generate or monitor avionic data for 1553 or 429 operation. The 1553/429 USB device is suited for a wide variety of applications including, but not limited to, box level testing, simulation, portable test equipment, flight line test and diagnostic, software development, system integration, and debugging. The device enhances the work of developers, integrators, testers, field personnel and flight test crew through advanced 1553 and 429 capabilities that are accessible in a portable form factor. The USB interface makes it ideal for use with desktop, laptop, or tablet computers. BC/Monitor or Multi-RT/Monitor per MIL-STD-1553 Channel.